Which one will prove to be number one of these two giants of the game? On November 24th, the opening of the 'Mlily Match of the Century' was held in Beijing. This 10-game match between go superstars Gu Li of China and Lee Sedol of Korea is organised by the Chinese Go Association and the Mlily Group. 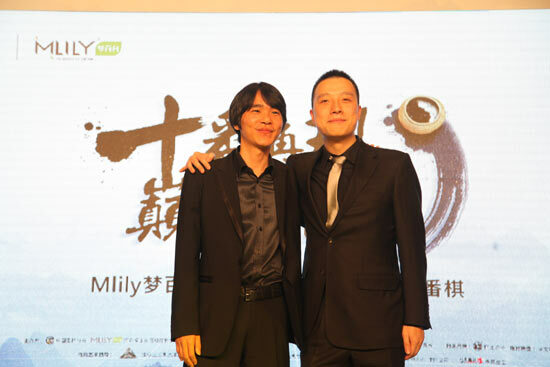 Mlily is a home deco company whose CEO, Ni Zhanggen is a big fan of go, they are also the organizers of the MlilyCup. It's the first time that two top players from different countries play a 10-game match and also it's the 10-game match with the highest prize in history. This is going to be a big game with a lot of attention in 2014. The head of the Chinese Go Association, Liu Siming, and the head of the board of the Mlily group, Ni Zhanggen, attended the opening along with other celebrities. On May 16th and 17th the first round of the 68th Honinbo Final took place in Oda, Japan, the birthplace of the Go Saint Honinbo Dosaku. Challenger Takao Shinji won seven games in the qualifiers to challenge for the title. The game, which can be found here with comments by Kono Rin 9p, started out with a new joseki after Iyama's attack on the bottom. After giving up some territory on the bottom to take sente, Takao managed to take the initiative and things looked tough for the title defender. 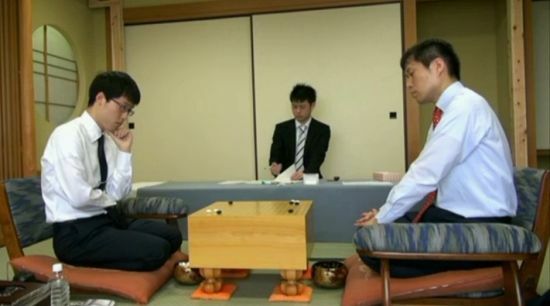 Iyama unleashed a do-or-die move to try and change the outcome of the game and it succeeded! Kim Jisuk, taking white in the second game, forced Lee Sedol to resign. 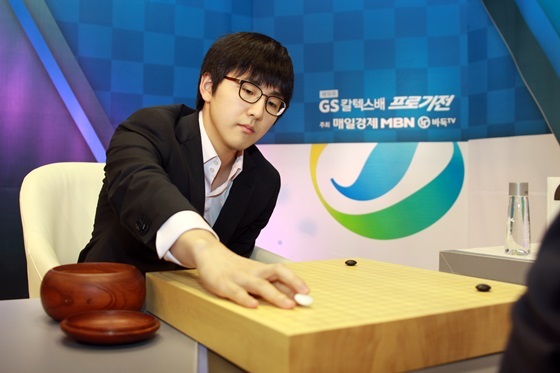 On the 22nd of April, 2013, the 23-year-old Kim Jisuk won the best-of-five final of the 18th GS Caltex Cup by defeating the legendary Lee Sedol with a staggering 3-0! Even though Kim Jisuk had not attained the rank of 9p before the match, most observers agreed that his power could rival that of the top players of the day. However, going up against Lee Sedol who is known as possibly the strongest fighter in the world he was surely destined to have a very tough challenge facing him. Unexpectedly he forcefully decided the final by winning three games in a row, not backing down one inch when Lee Sedol was putting him to the test in very difficult fighting. Zhou Ruiyang proudly holding up his champion prize. This is the second time for Zhou Ruiyang to win a national tournament. On April 13, the 13th Liguang Cup Go Tournament was finished in the Sheraton Hotel in Haikou, China. 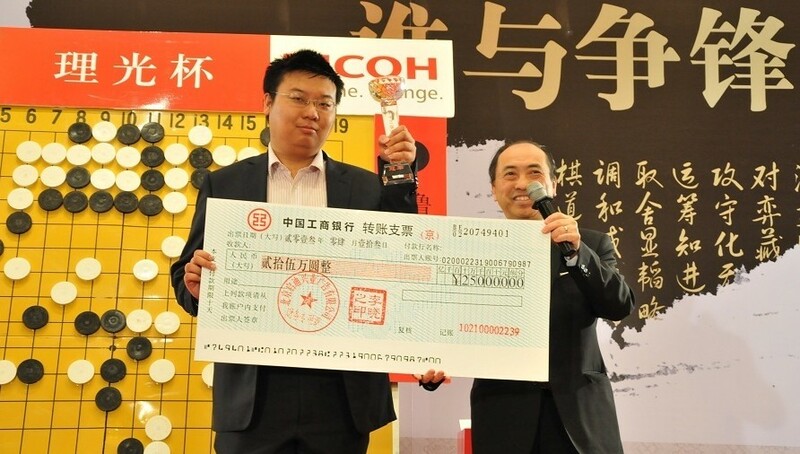 The final result is Zhou Ruiyang, playing black, beat Tang Weixing after 167 moves and received the title of the Liguang Cup champion for the first time. The prize money was set at 250,000 RMB. Tang Weixing got 100,000 RMB for his second place. This is the second time for Zhou Ruiyang to win a champion title in a national tournament. See the final game with comments by Chang Hao 9p, here! Welcome to the brand new version of Go Game World! For more than ten years Go Game World has provided contemporary professional games with comments by strong professional players. In a world where English commentaries on recent top games are hard to come by Go Game World has played an important part in making the wonderful games of the masters more accessible to a western audience. Throughout the years thousands of users have been able to gain insight into the world of pros and learn from their games. Now we are happy to introduce a new, better version of the website. Keep on reading to find out what's new! While continuing to provide this service steadily over the years, the design of the website and user experience has stayed virtually the same. Needless to say, after ten years it was beginning to look a little dusty. We have now updated the look and feel of the site to better accommodate the demands of our users. Accessibility: Now you can watch our games on several different platforms! Study a game on your phone while taking the bus or on your touchpad while lying in bed. Shareability: It is now possible to share a game that you like with your friends on social platforms such as Facebook, Google+, Twitter etc. User comments: Talk about games directly with other users using the comment feature. Updates: Learn about new games and other news in your RSS-feed or by following us on Facebook. Videos: We will update our site regularly with new videos covering a wide range of subjects such as the study of set patterns (joseki), opening (fuseki) and many other things! Articles: We will have article series on different ways to improve your go as well. Reviews of your own games: It will now be possible to send in your own games to be reviewed and commented by our teachers who have a vast experience in teaching and are experts at finding your weak points. We welcome feedback from our users and if you have questions or suggestions feel free to drop us an email or leave a comment directly on a post. At Go Game World we love go and we wish that more and more people can enjoy go through our website! The feeling that comes with improving is one of the most enjoyable parts of playing go. With greater understanding, the experience of playing becomes richer. But what are the best ways to improve? And do you need to be talented and start out young to become a strong player?